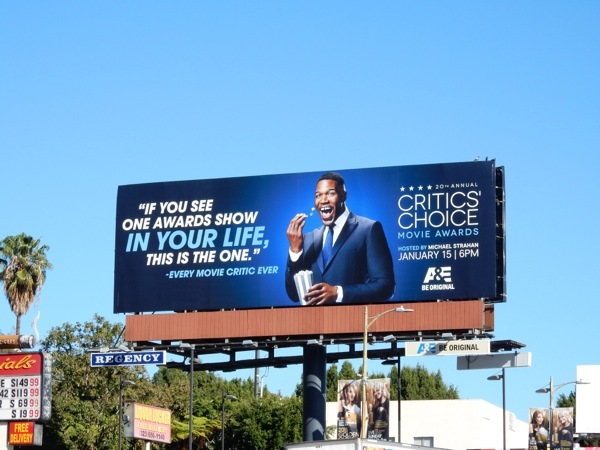 Awards season is in full swing in Hollywood, with Ricky Gervais recently hosting the Golden Globes last Sunday, the Oscar nominations announced this past week and now the 21st annual Critics' Choice Awards getting their time in the spotlight. 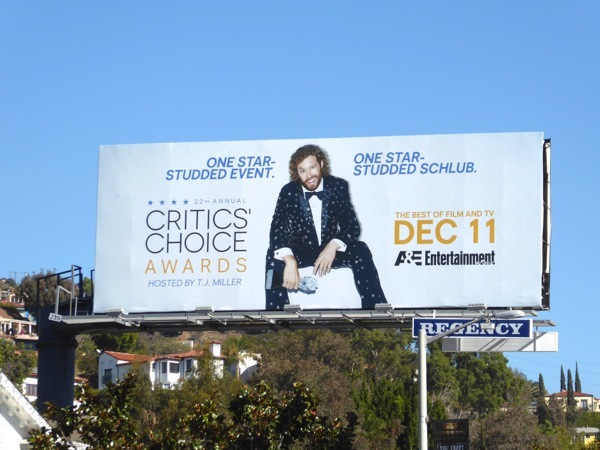 This year A&E will combine the TV and film awards, presented by the Broadcast Television Journalists Association (BTJA) and the Broadcast Film Critics Association (BFCA), into one big shebang hosted by comedian and actor, T. J. Miller. 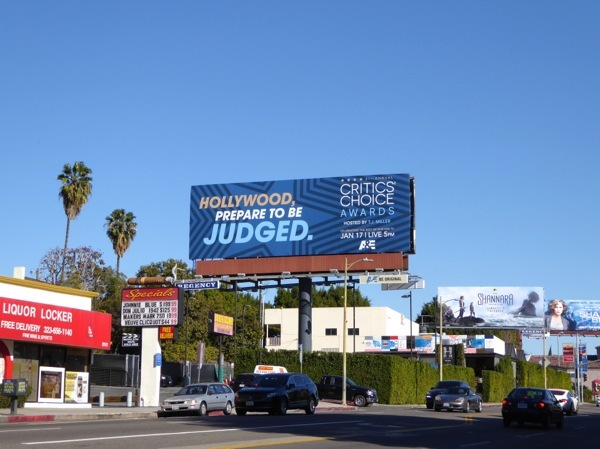 The 'Hollywood, prepare to be judged' teaser billboard for this year's awards was snapped along Sunset Boulevard on December 26, 2015, whilst the version featuring a reclined T. J. Miller was spotted in the same ad location along Sunset Boulevard on January 8, 2016. 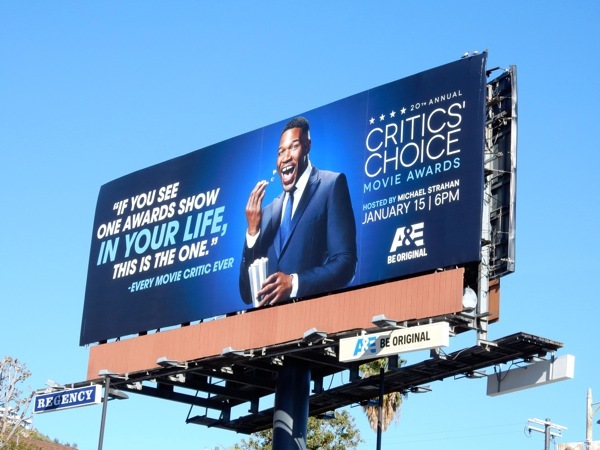 Meanwhile the 20th annual Critics' Choice Movie Awards billboard featuring last year's host, Michael Strahan, was photographed in the same West Hollywood billboard location on January 14, 2015. 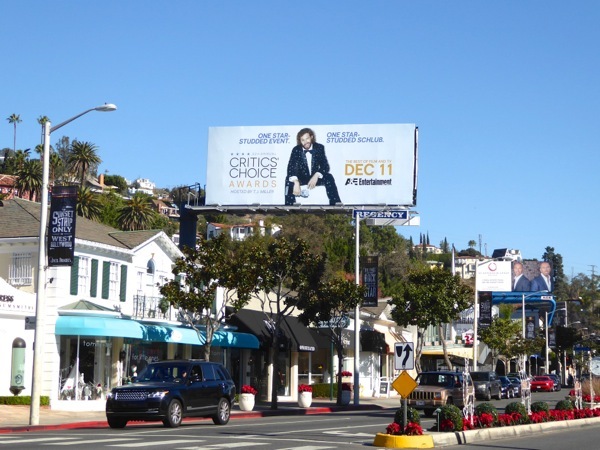 If you're a fan of T. J. Miller, you can also check him out in these billboards for HBO's Silicon Valley comedy series. This certainly is the red carpet season and a time for those involved in the big and small screen to mingle and share a glass or two (although let's hope there's no shuttle fiasco to the after parties this weekend. To think, all those poor actors and studio execs waiting for hours without a glass of champagne to keep them merry, there should be a telethon hotline to help all those that were traumatised). 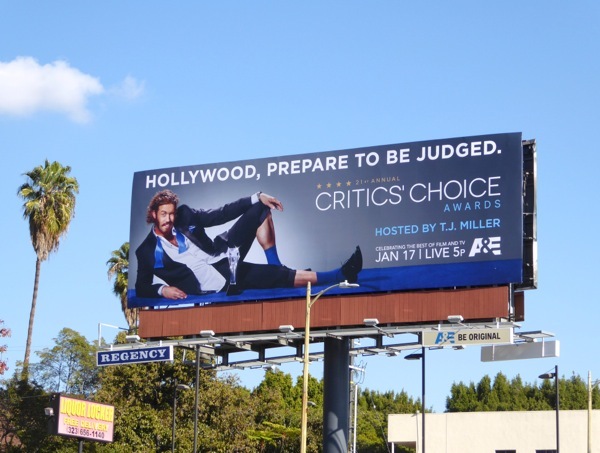 'Hollywood, prepare to be judged' (and win some awards), but we're sure that T. J. Miller will be kinder and less divisive in his hosting duties than Ricky Gervais usually is. 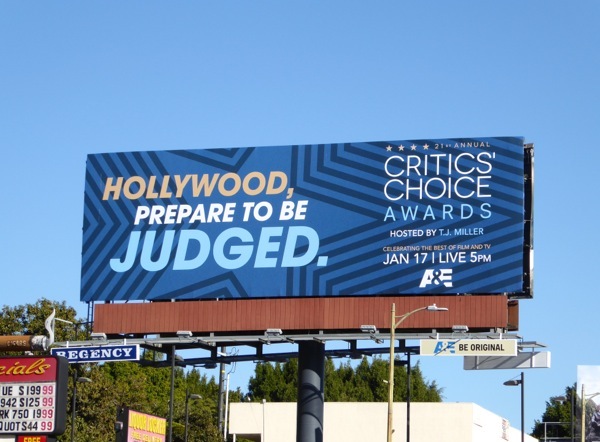 UPDATED: It's looks like the Critics' Choice Awards want to beat everyone else to the punch this year with their 22nd annual awards. 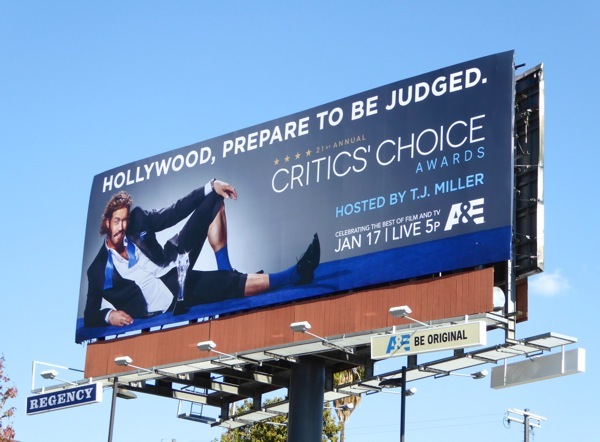 Not wanting to be lost in the clutter of awards season shows in the New Year, T.J. Miller once again hosts the industry awards where critics decide the best of the last twelve months of television and movies. 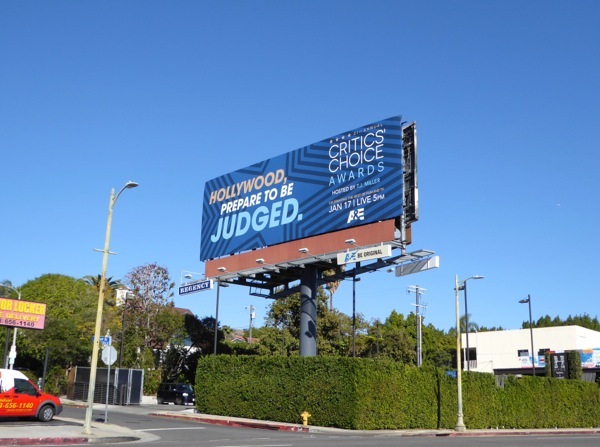 This billboard was spied above West Hollywood's Sunset Plaza on December 4, 2016.